Nepodin, found in the roots of Rumex japonicus Houtt. (Polygonaceae), inhibits osteoclast differentiation and has an antidiabetic effect. We propose nepodin as an ingredient of new functional foods or as a drug candidate for reducing the risk of reduced locomotion resulting from diseases such as osteoporosis. Although there are no previous reports of R. obtusifolius L., which is found throughout Japan, having roots containing nepodin, we found nepodin in the roots of this species. Therefore, R. obtusifolius as well as R. japonicus was considered a candidate raw material for nepodin extraction. 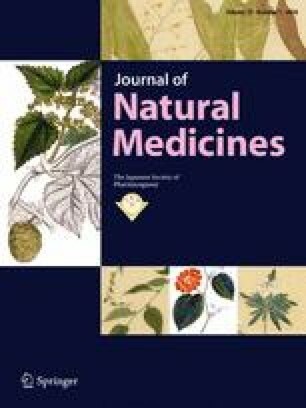 We also discuss the suitability of R. japonicus and R. obtusifolius as sources of raw nepodin for cultivation on the Ryukyu Islands. In this study, all specimens on the Ryukyu Islands were identified as R. japonicus. Conversely, all specimens on mainland Japan were R. obtusifolius. The DNA sequence of the chloroplast trnL–trnF intergenic spacer region and partial nuclear internal transcribed spacer was consistent with the identification of R. japonicus and R. obtusifolius by morphological characteristics of the perianth segments. Therefore, to avoid erroneous identification and misuse of the plant species used for extraction of raw materials, it is preferable to develop DNA markers for these two regions. The content of nepodin varied from undetectable to 0.34% of the fresh weight (%FW) in R. japonicus and from undetectable to 0.21%FW in R. obtusifolius. From a pharmacological perspective, as plants that might be suitable as raw materials for nepodin extraction, it became clear that both R. japonicus and R. obtusifolius can be used with the same expected extraction efficiency. Based on our findings, R. obtusifolius could not be confirmed as inhabiting the Ryukyu Islands. For this reason, to conserve the endemic genetic characteristics of the Ryukyu Islands and to prevent genetic pollution by R. obtusifolius, only R. japonicus should be cultivated on the Ryukyu Islands. The authors thank Mr. Masaki Matayoshi of the Okinawa Technology Licensing Organization Co. Ltd. for his support. This study was supported by a project commissioned by the Okinawa Prefectural Government.